How are all you over fifty bloggers & everyone else for that matter. After a week with Storm Gareth clearing out the cobwebs, it also bought a faulty phone line with it. I spent half the week without any phone or internet - the phone line wasn't really a problem because I had my mobile, but no internet for nearly four days was pure hell! Blogging, on-line shopping, searching and generally everything I wanted to do depended on the internet working, I wanted to pull my hair out! I was a bit like when I was younger & lived out in the sticks - when we had a power cut I'd think of doing things like the ironing!! Come on own up, you used to do that too??? I'd wanted to check out some gift ideas for Mother's Day, both for my mum and for me ( you know I like to drop hints). To be honest the best present you can give someone is your time. I love having all the children around me on Mother's Day - heaven! Although this year i'm going to a friend's wedding, so will spend time with the family on Saturday, hoping to take my mum out for lunch the following week - shushh don't tell her it's a surprise! For Mother's Day last year the kids surprised me with some boots, not just any boots though, they happened to find just the boots I'd seen in Next and bought them for me! Yes, you guessed they all have a sixth sense - not really I'd let slip numerous times the ones I wanted - lol. Since getting my ivory ankle boots they've been the finishing touch to so many of outfits making them a valuable addition and worthwhile present. White boots have been in the limelight over the past year, and seem to be going from strength to strength. Have you got yourself a pair? To be honest the best present you can give someone is your time. If you're looking for gift ideas (or if my kids are reading) here's a few pieces that caught my eye whilst shopping earlier in the week. Scrolling through IG recently I spotted at least three bloggers wearing pink blazers - these, my friends will be everywhere in the next few months, so grab a 'must have' when you spot one. I'm loving this Marks and Spencer Pink Blazer, that also comes in fresh green. Double breasted are always very flattering and can dress up a pair of jeans or create a casual look for a summer dress. Why not bag a suit with the matching trousers? Also fell for this jumpsuit. Do you know how much I love wearing jumpsuits? After my recent clear-out, my favourite palm print version had to go as it was too big for me! I just might just have to add this to my collection! Next have a wide selection of the same design, but this pattern clash version caught my eye - not to mention two of my favourite colours blue and mustard yellow. The price is £28 which is really reasonable for basically two items. Check out the other colours - they're all interesting and different. I can't wait to start wearing my sandals again, much as I love wearing boots it's so nice to get your tootsies out and embrace the warm weather. Ochre leather ankle straps are four words I'm liking. So how about these to add to a shoe collection? Also available in tan, these will set you back £45, and for the amount of outfits they'd pair with I'd say that's a bargain! How about jotting another yellow item to the list? I've been trying to broaden my collection of coloured bags - this would enhance my assortment of neutral bags and really come in handy. Unusually round it's a statement piece that has a choice of two handles, £30 and a medley of colours and patterns - what's not to love! I adore wearing my necklaces, they tend to be the finishing touches lots of outfits need. I have quite a few to my name, but there's always space for more! I saw plenty in Marks and Spencer but this Glitter Flower Collar really stood out - pretty isn't it! It's from the Skin Kind range which is perfect for sensitive skin. Available in White, pale pink, fuchsai and blue & any one of them will set you apart from the rest of the girls, finishing off your outfit a treat. Flowers are always winning presents - who doesn't love to receive a beautiful bouquet? See the stunning selection starting from £25 at M & S - choose your colour scheme and get them delivered for free! I found these beauties online in Next and just had to add them to my list, just in case you fancy getting yourself a pair! Western styles never go out of fashion & white are a fabulous twist that will compliment lots of outfits. Stock is low, so be quick! I know you're going to love wearing white boots - I sure do! 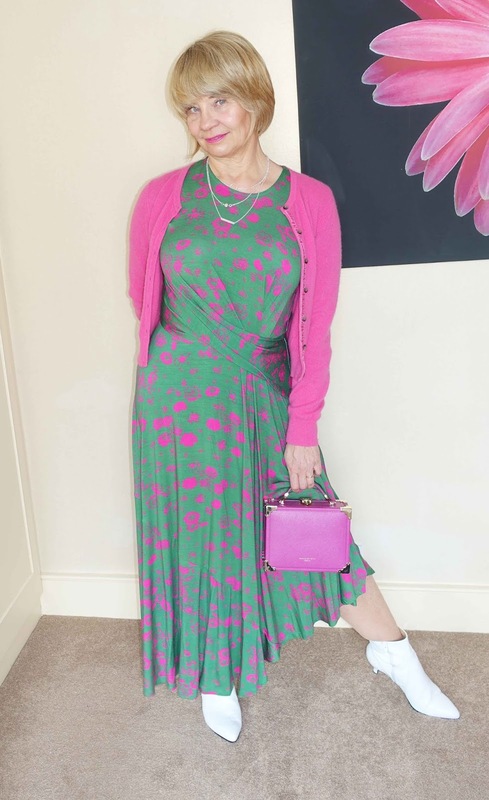 Favourite link from last week is my blogging friend Gail - Is this Mutton, who shared this stunning pink and green dress that really caught my eye. I'm on the hunt for something similar that maybe I can use for a Style Steal. Many thanks for coming to the blog today - can't wait to see what you've linked up. 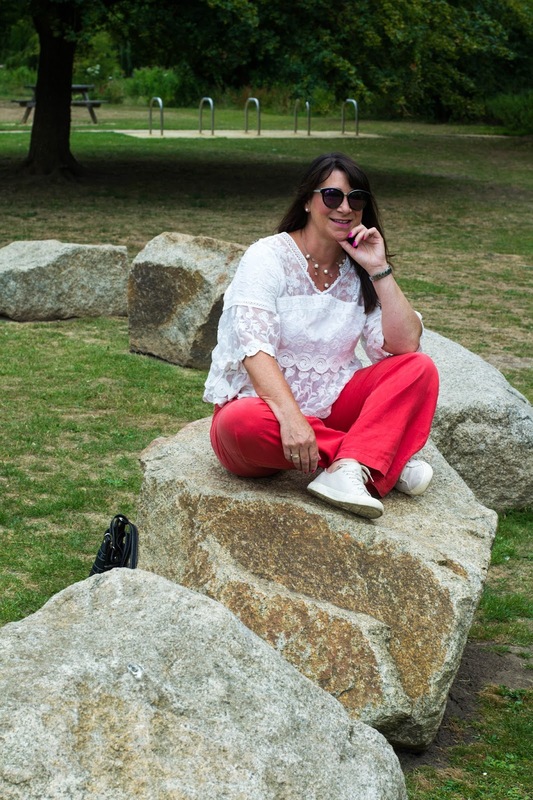 Labels: Fashion Over Fifty. Mother's Day Ideas. How sweet that your kids got you a gift you had your eye on! The boots are great and so useful - you'll wear them a ton.I agree though; the best gift is the gift of time, nothing is better! I love white booties! And I am loving your outfit! Argh! I'm kicking myself for not buying the white boots I had from the clearance rack at TArget. These look great on you and I love your list of gift ideas. The round purse is adorable. I have a pink one and love it! I'm such a white boot fan, Jacqui!! And a pink blazer? Count me in!! Thank you for the link up! Hope your week is going well! Thank you for hosting us. I am following you and would love for you to follow back. It is wonderful to see us bloggers get together no matter what our age is! These are great ideas for Mother's day gifts. We don't celebrate Mother's day till April here in U.S and these are all great ideas. Love the blazer. Your outfit is perfect for Spring and these ankle white booties are super adorable. That was a lovely surprise, seeing me as link favourite! Great ideas Jacqui, I'm sure your kids will delight you again. I need to think about what to get my mum too. I saw such a cute round bag at Target the other day, but lately I have been practical and just been using the same crossbody bag. It was tempting though! 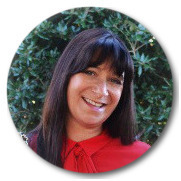 Jacqui, I love your pics! First ,those white boots look fab on you! I was thrilled to get a pair this year too and enjoy wearing them. 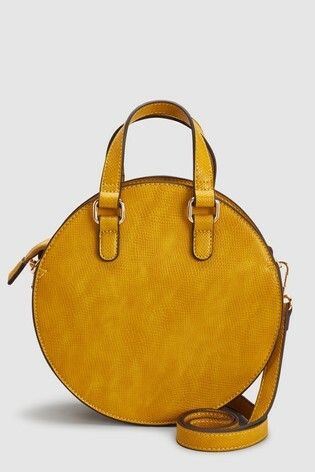 I am in love with those yellow sandals and round bag! I am looking for a white round bag for Spring. All great ideasfor Mother's DAy too! I’ve been on the lookout for a nice pair of white boots. Love the ones you’re wearing in the last pic - they look fab with the dress. Happy mother’s day. I agree with you that time is the biggest gift. I just bought a pair of white boots and I've been wearing them nonstop! I also love that pink blazer you posted—I think I need one of those! You are quite right about giving your time as a gift to our mothers for Mother's Day! My children know I love flowers and sharing the day with me. I am thinking I need a little round bag! It's very popular for spring! Little bags to hold a phone and a lipstick in! Thanks for the ideas. And you're right, the best gift is time! Your white boots look super cute with the maxi dress, too. It's the worst when the internet goes out! It feels like you're living in the dark ages! Lol... I love those white booties! I'm definitely obsessed and have a few pairs! Aww that's so sweet! I love the pink blazer and flower necklace - so fun for spring! 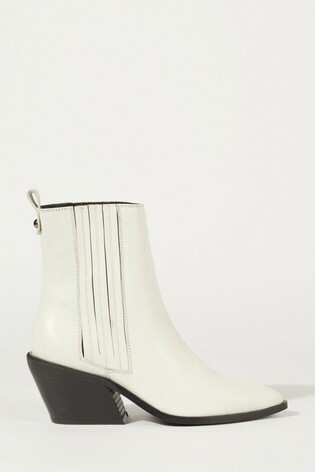 How funny - I've just posted my new white boots today and I have to admit I seemed to miss the trend completely! Yours look fab with your dress and that's a look I'll be trying next, thanks. I hope you do get some of your hints as gifts for Mother's Day! I agree, I used to love physical gifts more, but as I've gotten older I love the gift of time and memories made. I love those white boots. Oh gosh, 4 days without internet would drive me crazy. I'd have to live at Starbucks for some free wifi or something! What a fun list of Mother's Day Gifts! I don't own any of the ankle boots in the lighter colors but its on my list! Maybe next year since I just broke my ankle a few weeks ago! I really like that pink blazer, too! I've recently bought some white boots - my mum rather diplomatically said they make my feet look big! When you've got size 8 feet all shoes make them look big! I love the blazers and the round bag, and the necklace is so pretty. No internet would drive me crazy! How did we live without it?! Hope you're getting on okay with the white boots. Yes lack of internet was driving me. love your white ankle boots! Great Mother's day gift ideas. Style not Age - March Madness! Style Steal - White and Gold Re-Re-Created! Ted Baker in the Rain!